75 years ago today, Orson Welles freaked the hell out of people with his War Of The Worlds broadcast. In retrospect, it was the first viral media event. To this day, people debate how much of the hysteria was planned. At the time Welles had a reputation not unlike James Franco today: an ambitious actor with grand intellectual pretensions. 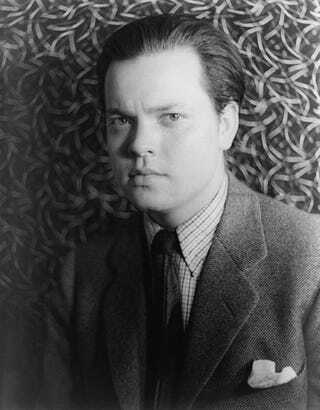 Having just turned 23, Welles had already staged memorable productions of Shakespeare and modern plays and starred as The Shadow on radio. His new series, The Mercury Theatre Of The Air, was adapting famous works for radio. For the Halloween show, Welles chose to adapt H.G. Wells's War Of The Worlds, updating the story and relocating it to North America. For the first half of the program, scriptwriters Howard Koch and Anne Froelick adopted the format of a fake news broadcast. Several things suggest that Welles knew exactly what he was doing. In addition to the fake news concept, Welles featured a speech by a fictional Secretary Of The Interior. Originally, the speech was to be by President Roosevelt, but CBS balked at the idea. Nonetheless, Welles had the actor do Roosevelt's voice, giving the impression that FDR was addressing the alien menace. As well, one of the most dramatic moments - a "live" report of a Martian attack - came after the 15 minute mark. This usually coincided with the end of the opening monologue on The Chase And Sanborn Hour, which was the top-rated show in the timeslot. During the musical number, listeners switched stations at just the right time to hear reporter "Carl Phillips" deliver a panicked broadcast from Grover's Mill, New Jersey that got cut off in mid-sentence. On the other hand, the fake news conceit only lasts for the first half-hour of the broadcast, with the second half being a straight dramatization of the novel. Whatever Welles' intention, the result was a media frenzy. The full extent of the panic may have been exaggerated, but the press jumped on the story, in part to throw a harsh spotlight on radio. Welles issued a public apology, but claimed that he didn't intend it as an actual hoax. It's easy to make fun of radio audiences for believing the broadcast, but it's more understandable considering the times. There was much anxiety about the situation in Europe, and some believed that even the US wasn't safe from a Nazi invasion. At the timeRadio was the only medium with a wide, instantaneous reach. Finally, anyone who thinks that people are less gullible these days should check their Facebook wall for messages from relatives who are convinced that President Obama is a secret Muslim born in Kenya. This is Orson Welles, ladies and gentlemen, out of character, to assure you that The War of the Worlds has no further significance than as the holiday offering it was intended to be; The Mercury Theatre's own radio version of dressing up in a sheet and jumping out of a bush and saying "Boo!" Starting now, we couldn't soap all your windows and steal all your garden gates by tomorrow night, so we did the next best thing. We annihilated the world before your very ears and utterly destroyed the CBS. You will be relieved, I hope, to learn that we didn't mean it, and that both institutions are still open for business. So goodbye everybody, and remember please for the next day or so the terrible lesson you learned tonight. That grinning, glowing, globular invader of your living room is an inhabitant of the pumpkin patch, and if your doorbell rings and nobody's there, that was no Martian, it's Halloween.